Tim Holtz beware ! I don't do 12 tags of Christmas. I do 30 before ! And this one is the 22nd ! I started on white cardstock, cross-layering the tissue tape Tidings. I distressed the edges of the tag with aged mahogany and vintage photo, then stamp the tree (Hero Arts) with a clear embossing pad. I sprinkled Antiquities weathered white embossing powder all over the tag, and tapped the tag to get rid of the excess. I even blown a little bit on the edge, and use my heat gun on the tag. The distress ink retain just enough powder to create this snowy effect. Love it ! 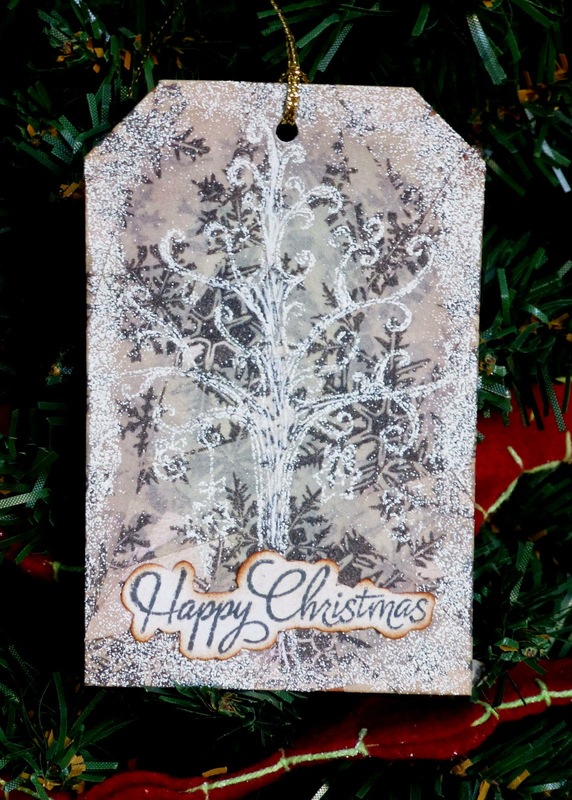 I just add some stroke of white gel pen inside the tree, and fussy cut a stamped sentiment to finish this tag. What do you think of this one ? Would Tim Holtz like it even a tiny bit ? I hope you do, and I will see you tomorrow for another tag.